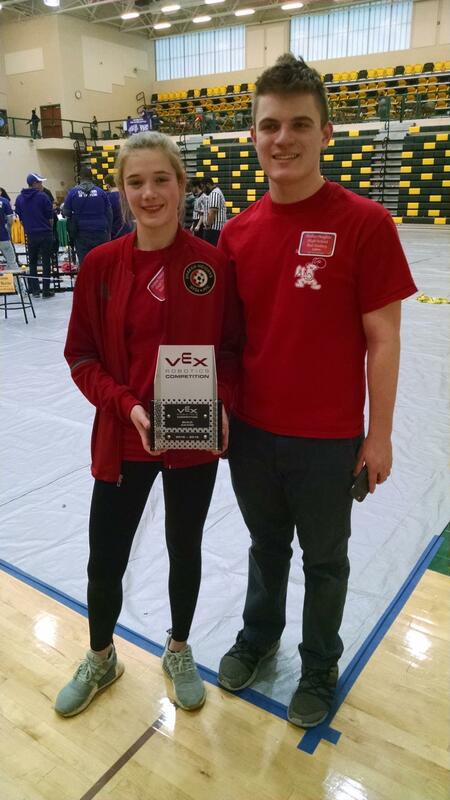 December 17, 2018—Congratulations to Shaker Heights High School Freshmen Katy Christian and Ben Schattinger for winning the Build Award at the Akron VEX Robotics Competition on Saturday, December 15, at Firestone High School. This was their first high school robotics competition and they qualified for the Final Tournament rounds as well. They were awarded the Build Award by the judges for a well-crafted and professionally constructed robot that efficiently uses mechanical and electrical components, demonstrates reliability on the field, and the team members demonstrate collaboration, excellent interview skills, and team professionalism. Way to go, Katy and Ben!